Broken Suspender Tabs can be a pain, now you can replace those old tabs with new ones! An authentic style worn in the late 19th Century, they will age to a mellow lived-in look. 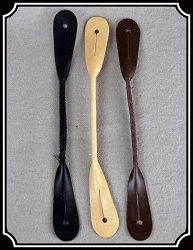 Made to your order please allow 6 weeks to Continental USA. 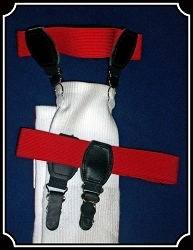 Y-back suspenders made of light-weight cotton webbing ~ black leather button-on tabs. 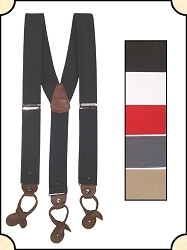 Keep your Trousers right were they belong with this Elastic suspenders, made for long rugged wear. 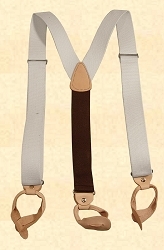 These X-back canvas suspenders are made with adjustable buckles and leather button-on tabs.